Since a globe is round, there is no beginning or end. However, there are two reference lines that help to determine distances and locations. The first line is the equator, which runs east and west around the middle of the globe and divides it in half. these lines, latitude and longitude lines have both been drawn. When using the globe to find locations, remember that the lines that run parallel to the equator are latitude lines. Latitude lines are at fifteen degree intervals apart starting from the equator. These lines can help to determine the location of areas on the globe. For example, New Orleans is found north of the equator at thirty degrees. Because of this, New Orleans is thirty degrees N latitude or 30N. Lines that run north and south from the poles are longitude lines or meridians. These lines have been drawn at fifteen degree intervals starting from the prime meridian. New Orleans is located ninety degrees west of longitude. When combining longitude and latitude for this location, the city will have the location of 30N latitude and 90W longitude. When looking at longitude and latitude, keep in mind that latitude lines start at zero degrees at the equator and run to ninety degrees at the poles. Longitude lines, on the other hand, start at zero degrees at the prime meridian and run to one hundred eighty degrees. Latitude is always listed first when determining the location. It has been over a thousand years since a circle was first divided in the manner that we see globes divided today. Today, the globe is divided into 360 sections that are degrees. These degrees help locate different areas on the map. However, since the size of the Earth is so large, it is also important for even more detailed sections to be determined. Each degree is broken down even further into 60 parts called minutes, which are then broken down into 60 parts called seconds. Seconds can even be broken down even further, which can lead to the ability to locate anything on a globe, no matter how small. In fact, it is possible to locate a single house on the globe because of this system. Each degree of latitude on a globe is equivalent to about 69 miles. This is fairly consistent because of the way that the lines of the globe have been set up; parallel and equally distant. However, this is not the case with longitude lines. These lines gradually converge toward the poles, where all lines meet. There are zero miles between them at this point. However, at the equator, these same longitude lines will be 69.17 miles from one another. One of the downsides of using flat maps is that they offer a distorted view of the distance between two places. The reason for this is the misconception that is seen when looking at a flat map. With a globe, one is able to see true distances and locations of important places around the world. A globe is also helpful, not just for learning more about the modern world, but with learning about the history of the world. By using the globe, it is easier to see significance with the historical events that have occurred. Learning more about a globe is the best way to find the greatest benefit from relying on them. 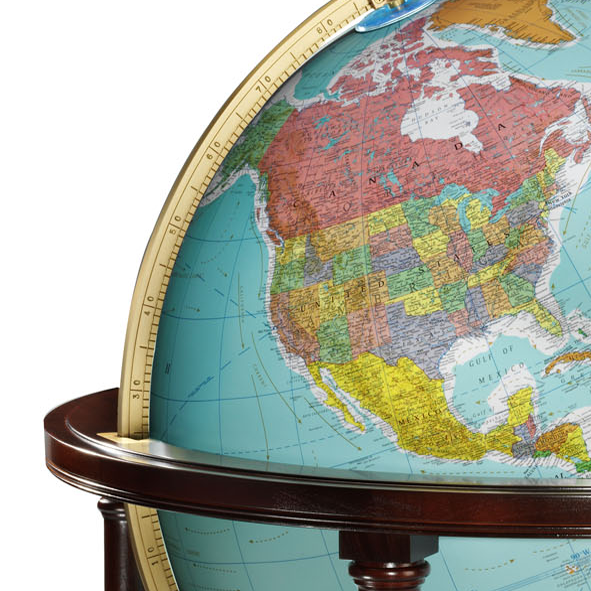 By understanding how to use a globe, a person will easily be able to locate important areas on it. In order to learn more about how to find locations on your globe, be sure to contact us today.